The World Day for Cultural Diversity for Dialogue and Development provides us with an opportunity to deepen our understanding of the values of cultural diversity and to learn to “live together” better. 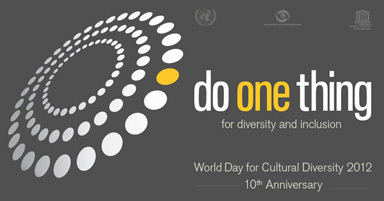 The UN General Assembly proclaimed 21 May the World Day for Cultural Diversity for Dialogue in its resolution 57/249 and welcomed the Universal Declaration on Cultural Diversity adopted by the General Conference of the United Nations Educational, Scientific and Cultural Organization (UNESCO) at its thirty-first session on 2 November 2001 and also welcomed the main lines of the Action Plan for the implementation of the Declaration. For the World Day for Cultural Diversity for Dialogue and Development 2012 the IDEA Society invites creative children from the International Schools in Vienna to write essays about the different PANGAEA paintings, telling a story about "Our society of today and tomorrow". Rules: The essay should tell a story about "Our society of today and tomorrow" from the scene of the chosen PANGAEA painting and link to the cultural diversity of our society. State at the bottom of the essay your name, age, and the name of your school. The best entries will be published on the IDEA Society Website and later in the PANGAEA Collection Book.